“Not many left,” rasped the bird. It was sitting on a high branch, in one of the trees stretching far above, near the top of the dome. The branches pressed up against the glass in places, as if straining to push it away. Far below, Mhumhi heard a faint hiss, and looked up just as a gentle mist began to waft down. The heated air filled with water, intensifying the cloying smell of plant matter, flush and rotten. Three of Hlolwa’s attendants had come back through the foliage with things in their mouths. They laid them down at Hlolwa’s feet and retreated. “Come here, Mhumhi,” said Hlolwa, raising a paw slightly. She had laid down on her side again on the dense bed of leaves, her head erect and regal, with her tail curled over one of her hind legs. Mhumhi stared at her, still tense and frightened. From behind him there came a great deal of crashing and crunching, and Imbwa emerged from the bushes at the base of his tree, shaking himself. “Go on, you,” he told Mhumhi, giving a snap in his direction, and Mhumhi skulked forward towards Hlolwa, far closer than he would have liked. Imbwa pushed past him and rolled one of the round things at Imbwa’s feet towards himself with his paw. Mhumhi saw that it was a sort of round and flushed thing, bleeding bright yellow in the places where the attendant’s teeth had pierced it. It smelled sickeningly sweet. Imbwa pounced upon it and tore a chunk of the soft flesh loose. “Have you eaten fruit before, Mhumhi?” Hlolwa asked, her clear eyes catching his. It took Mhumhi a moment to answer. The humid air and the perfumed atmosphere were making him feel sick and dizzy. “Yes,” he said, taking small pleasure in the brief way she seemed surprised. But it was only for a moment; then she crossed her forepaws and lowered her head a little to smile at him, showing the teeth in the side of her mouth. Mhumhi rocked a bit on his paws, trying to keep his head clear. He had a sense that it would not be good to discuss what had happened within the boudas’ lair with these dogs. After he was silent for a moment, Hlolwa spoke again. She rolled one of the fruits towards him with her nose. He looked down at the way its papery skin had been crumpled back in places. “I don’t like fruit,” he said. “If he doesn’t want to eat it, that’s fine,” said Hlolwa, her eyes half-lidded. Mhumhi took a breath and bent his head down over the fruit. His lips grazed it- it was soft, plump shape covered in a light coating of down. He opened his jaws and took a wary bite, and in they went, sickeningly easily, swiftly cleaving it. He was surprised and a little appalled to find that he did indeed like the taste better than that of the disintegrating preserves Danai had once given him. “Eat up now, skinny,” sneered Imbwa. He had eaten his own fruit down to the hard brown pit, and this he now took into his jaws, cracking it loudly. Mhumhi kept his head down. He was uncomfortably aware of how much larger and well-nourished the other dogs here looked compared to him. Hlolwa blinked at him, then exchanged a look with Imbwa, who seemed on the verge of laughter. “About what,” Hlolwa repeated, in a slow drawl. Now Imbwa really did laugh. Mhumhi laid back his ears. This sparked scattered laughter from the attendants lounging behind them, many of them looking at Hlolwa as if she wasn’t letting them in on the joke. 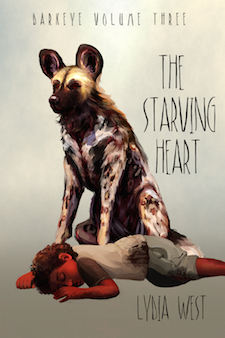 Mhumhi opened his jaws and shut them again, his heart pounding. His mother? His… other mother? “My…” Mhumhi hesitated, feeling like he was reeling. “Because-” Mhumhi stopped, and uttered an angry little snarl. They were all staring at him now. “She did not,” said Mhumhi, through his teeth. “How did you know her?” Mhumhi demanded, cutting in. Imbwa looked affronted, but Hlolwa raised her head to answer him. “What’s a- a white-tail?” The term confused Mhumhi, for he could remember both Imbwa and one of Nzui’s pack members hurling at him. “What sort of peace?” Mhumhi asked, wondering why a term for a peace-loving group had sounded like an insult. “Why did she disappear?” asked Mhumhi. Hlolwa gave a small yawn. “Oh,” said Imbwa, and he let himself flop dramatically down into the leaves. “I don’t see what this has to do with anything,” Mhumhi said, bristling. She paused, tilting her ears this way and that. “I have a pack!” snapped Mhumhi. He cast an angry eye over Hlolwa; he didn’t see why she deserved to have any such allegiance. That shut Imbwa up rather abruptly, and he turned and looked at Mhumhi in a flurry of leaves, expression startled. “What did she set out to do?” asked Mhumhi, though he was beginning to get an uneasy idea. Hlolwa rolled the fruit from side to side under her paw. They were all silent a moment, and the sound of fluttering wings in the upper branches became more audible. Hlolwa’s attendants all looked very round-eyed at her words. Imbwa gave another of his little snorts, and Hlolwa sent him a swift, urgent look, rather unlike her usual languid demeanor. Mhumhi stared at her blankly, wondering what ‘political’ meant. “Dogs and hyenas, too,” said Imbwa, giving Mhumhi a severe look, as if he needed reeducating. “Ah, and it’s worked out so well for them, hasn’t it?” Imbwa huffed through his nose. “But why should it have-” Mhumhi stopped himself. Mhumhi was skeptical of this sudden show of sympathy, and his suspicions were confirmed when Hlolwa went on. She glanced briefly at Imbwa, who had curled to lick at his haunch. Hlolwa and Imbwa exchanged an amused glance, and Mhumhi got a sudden little shock. “Raised in the same litter,” said Hlolwa. “But not related by blood!” cried Imbwa, his tail wagging, as if he were quite proud of this fact. “We know we’re not really related!” cried Mhumhi, flattening his ears. “Yes, but…” Mhumhi stopped and stared at him for a moment. Imbwa bristled a bit under his gaze, raising his nose. “Calm down,” said Hlolwa, and she rose to her feet as well, and much to Mhumhi’s surprise she stepped closer and licked his ear. He went stock-still. She sat back on her haunches, surveying Mhumhi from under half-lidded eyes. Mhumhi said nothing. Above him there came a rustling, and the bird poked its head out, looking down at the assembled dogs with its beady black eyes. Mhumhi stared at the leaves on the ground. His half-eaten piece of fruit was still lying there, its dark pit bared. Mhumhi opened his mouth, and Hlolwa cut him off. “What do you mean?” But Mhumhi knew, and his tail tucked low, under his belly. The words hit Mhumhi like sharp bites, one after the other, gnawing the heart out of him. Mhumhi was breathing hard, his belly sucking in with each breath, and he raised his head skyward. Two-thirds? Two-thirds? How was such a number even possible? How many dogs would that be? He couldn’t even imagine it… Oldtown was just a corner of the city, and there were so many living there! The bird looked down at him from the branch above and made a harsh rasping sound. No, he thought, no… it was like Lamya had predicted, not enough food, not enough for everyone… Would the dogs fight in the streets, too? Would they try to kill and eat one another, like animals, like- like- humans? A horrid thought suddenly occurred to him. He knew where there was a great deal of meat. And it was not dog. “Mhumhi,” called Hlolwa, perhaps not for the first time, and he snapped out of his reverie, shivering. Hlolwa had raised her head and gazing down at him through amber slivers. He swung his head up to stare at her, stunned, and Imbwa behind her was laughing, and the attendants were laughing. Hlolwa did not laugh, she merely gave that smile, turning her head, letting her teeth show on one side. “Aren’t you tired of living off scraps in Oldtown like fox?” like a fox? like the foxes?